Are you sick of hearing your pet’s tags jingling? There are a couple different types of pet tag silencers that can be used to stop the jingling. 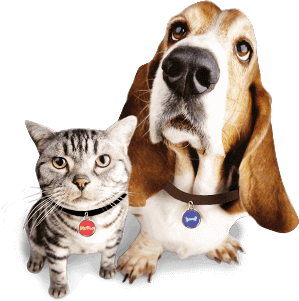 One type of pet tag silencer comes in the form of a rubber ring that goes around the perimeter of each tag. This rubber ring serves as a “bumper” of sorts, so the rubber rings collide instead of the metal tags. This can also prevent damage to the engraving that occurs when tags continually rub together. Rubber ring-style dog tag silencers will not prevent the tag from hitting the ring or other collar hardware, so it won’t silence the tags completely. And the rubber rings can be difficult to find for unusual tag shapes or sizes. Another type of pet tag silencer comes in the form of a little pouch. 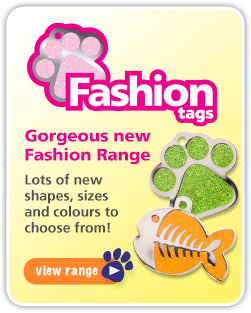 These can be used with any size or style of tag and they will prevent all forms of jingling. It will prevent the tags from colliding with each other and it will prevent them from hitting the collar ring and hardware. The downside to pouch-style pet tag silencers is that they cover up the tags, so you can’t enjoy the decorative designs on the front of the tag. But they do tend to keep the tags in great condition. 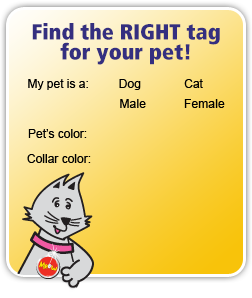 Notably, you should seriously reconsider if you wish to use a tag silencer for your cat’s tags. The reason? The jingling of the tags serves to give birds and other wildlife a bit of advanced warning that they’re being stalked. This helps to save the local wildlife from falling prey to your cat. In fact, that’s why many cat collars are equipped with bells!